Here are some of my creations. All of my designs are original even though they may be inspired by others. It means that a lot of effort is put into research, prototyping and field testing. It is not always easy to find the time for these creations but it is where the real fun lies! With the ever increasing simplicity and power of recording software, the old problem of getting a great guitar tone on "tape" at home is well and truly alive. Digital and analog modelers like the Sansamp and the POD have helped home studios to reach new level in terms of quality fifteen years ago, and they still do, but they are not the answer for everyone. If you want to record your very own amplifier, if you cannot stand the latency that comes with digital processing however small it is, or if you simply feel that nothing is better than a real amp, then you have to live in the middle of the country side or you'll never be able to properly record at home (unless you have the seldom encountered deaf neighbours). This has led to the appearance of isolation cabs about twelve years ago. These days, Randall makes a cost-effective unit and Rivera offers an expensive but great sounding cab. My aim was to offer the highest quality tones while maintaining a simple design that would keep the costs down. 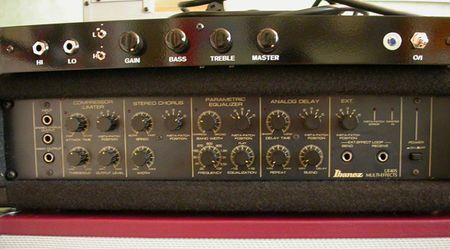 Randall's unit is great but its design doesn't take into account the appearance of standing waves inside the cabinet and this results in the infamous "boxy" tone. 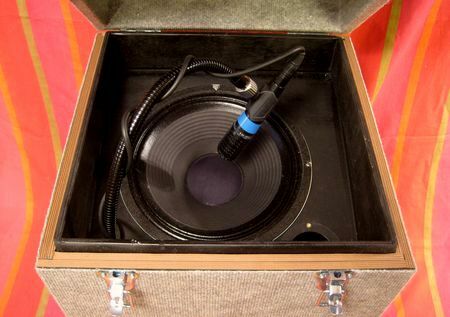 By employing an angled baffle inside the cabinet and with the use of damping material and diffusors, I was able to tune the enclosure and avoid this dreaded coloration of the tone. A special vent also allows to further tune the system and adapt it to various speakers. I surprised myself with the qulity of the result. The recorded tone is clearly a step up from digital modelers and only inferior to a traditional miked-up cabinet by the lack of a room sound which always colors the guitar tone in professional studio, however close the mike is to the speaker. Adding a good quality reverb in small amounts counteracts this effect nicely. The attenuation of the guitar sound goes from 10 to 40dB depending on the frequency, which means that although one can still here the amp while the cab is closed, it is possible to hold a normal conversation in the room with while your 50 Watt valve amp is raging away. If you don't want to hear the amp at all, just put the iso-cab in the next room! There have been a few stand-alone tube reverb units. The most famous is of course Fender’s 6G15 but Peavey, Premier, Supro also made one. 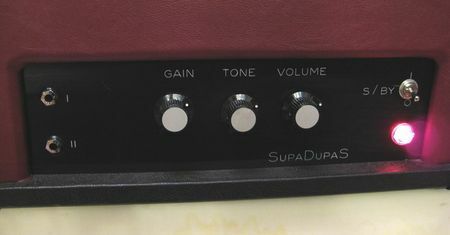 Soldano, Guyatone and Dr Z still offer such type of units. While working on transformer-less tube power amp designs, I had the idea of applying the theory to a tube reverb unit and see how it would sound. Ampeg produced amplifiers that drove their tank reverb without a transformer but the results produced mixed feelings (some say they offer the absolute best reverbs, others simply don’t like them). I decided to adapt a particular tube power amp design for high impedance loads to drive a reverb tank. While the rest of the circuit is derived from Fender’s 6G15, the unit can produce reverb tones with a greater bass and highs content while being less prone to that famous “boingy” sound on the guitar’s attack. The result of the transformer-less design is a well-defined and smooth reverb tone that is more an ambience effect than a special effect: more spacey and less surfy. It therefore works better for high-gain rock or power pop than the 6G15. Following the success of my Custom 15 (further down this page) every time I take it out to gigs or public rehearsal rooms, I decided to build a 50 watt version of its Brilliant channel to take it to the largest venues. Despite, or thanks to its apparent simplicity, this amp works great with many types of speakers from cheap Jensens to the best Celestions. Contrasting with the current trends, there is no need for elaborate EQs, multi-channel possibilities, or gain switches. It can cover a lot of ground with its sole 3 controls. From clean to crunch, it simply sounds great for almost any styles. And metal is only a Boss HM3 or MZ2 away... but it would be a shame. It also sounds deep and focused with a bass using input 1. Input 2 is the same circuit but with slightly less lows, which is ideal for the cleaner sounds. Simple designs usually have the most pleasing and natural tones and this is another good example with notes fading naturally into their second harmonic. Some elaborate circuits sound very good but you have to work on them to get the best tones. With this amp, you can shape your sound in seconds. Here's my latest creation on top of my Groove Tube Trio Preamp. It all started when I bought an old valve radio in a car boot sale. Its transformers were in good shape and begging me to give them a new life. The opportunity to put an old design of mine into practice was too good. The idea was to build in a 1U rack enclosure a small valve amp that could be also used as a power amp, or even as a preamp integrating power amp tone characteristics. Here's the result! The preamp features a 3 band EQ and a bright switch. Its design is unique as the tone needs to be tailored to the power of the amp. The FX loop is located after the EQ and will be mainly used as the input of the power amp, which is controlled by the master volume. Inserted before the speaker outs is a power soak that allows driving the power amp's 6V6 hard without putting the whole 6 Watts out. It CAN be really loud! Speaker outs are located on the back of the unit as well as a line out with a dedicated level control. The tone is quite modern and the mid EQ is very efficient to allow for a large variety of sounds and for the discrepancies of tone when going from whisper quiet to all out 6-watts mayhem (see the Fletcher-Munson article in the Tech Infos page). In short, the amp can give a Fender Deluxe clean, up to a more British crunch or even a raging Champ tone with everything flat out. As planned, it can be used as a standard amp, as a mini power amp, or without a load, as a preamp giving power amp tone and compression. 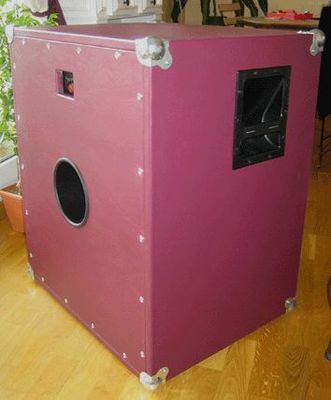 This 2 by 12 cab was specially made for the recording of Poncharello's latest album. I had 2 Celestion G12T75 speakers waiting in their boxes for years and I finally decided to make something out of them. 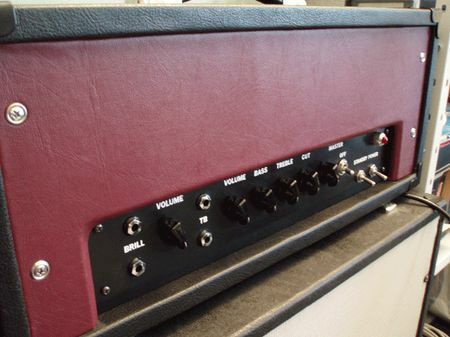 In case you wonder, the amp on top is my Custom 15 (see below). 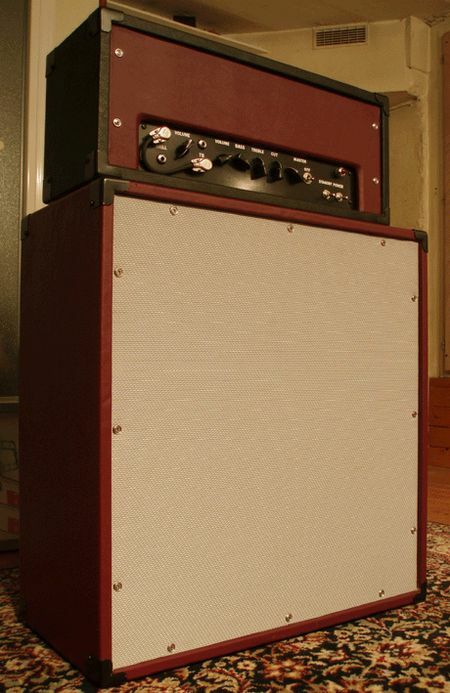 This cab is roughly the size of a blond Bassman, but it is deeper for an improved bass response. 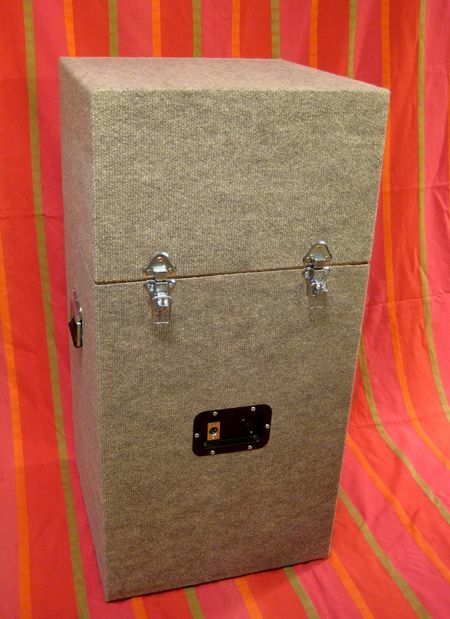 It can be used closed or open back, and the design allows for some resonance, which I prefer in my cabs. I used high quality plywood to build it: it is fairly cheap, very resistant and very light. The cab can easily be transported with one hand. I have to say I am quite proud of the result: it has a deep AND fairly tight bass response, and doesn't give the harsh top end that many G12T75 equiped cabs have. Sound engineers and players like it very much to the point ditching their Marshall 412 and asking me to build them one! On top of my good old Ibanez UE405 is my 1U bass valve preamp... 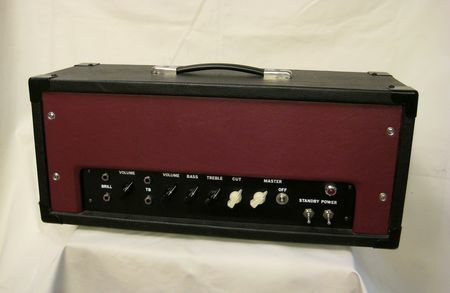 It is based on a 70's Ampeg design, with a 2 band EQ and high and low boost switches. It is very simple to use and just sounds great from clean to crunch when coupled with a good solid-state or valve power amp. This is a massive bas 4x10 that I built using four Celstion G10T75, which as their name does not suggest are sturdy bass speakers. It can easily handle 300W and the schematic is here. The cab is ported from the back using a big 150mm pipe. The reason behind this is that I wanted to tune it to 32Hz to have a good response down to low C. I usewww.linearteam.dk/ website to calculate the dimensions, based on the speakers Thiele-Small parameters. I used 18mm ply and loads of bracing. 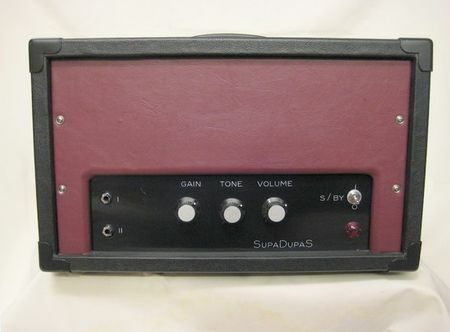 Since 2005, I use this amp regularly when I am gigging in smaller places like pubs: it is loosely based on a Vox AC30. It is rated at 15 watts but I always have spare headroom, even with our LOUD drummer. I used old Heathkit transformers salvaged from the first amp I ever modified. The first chanel is close to a non top boost AC30's brilliant channel, while the second one is pretty much like a TB. It is fitted with a switchable master volume and offers the traditional output stage Cut control. The two channels are in phase so it is possible to blend them: I did that one long before Vox did it with their chinese made AC30s. The main advantage of this for me is that one of the channels can be used as some sort of parallel effects loop for all ambiance and delay effects. The heaters are powered with an alternative supply sitting at +10V: this trick actually makes the amp quieter than with a regulated heater supply. The main supplies rectification is done with diodes but a simple circuit gives just the right amount of sag for a nice compressed sound. And finally, the output is protected so that the amp can run flat out even without a load connected to its output. 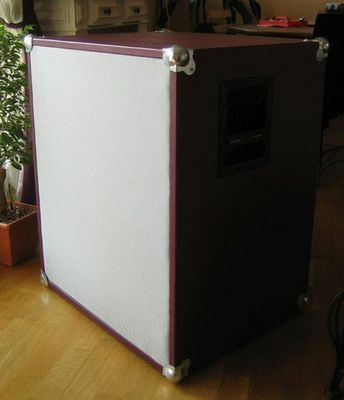 On this picture, the amp is ont top of a 4 by 10 cab that I made using Jensen P10Rs. The dimensions are that of a blond Bassman and it is of course an open-back design. The Custom 15 sounds a lot better through Celestion-type speakers but it is nevertheless possible to get some great clean tones with this combination.